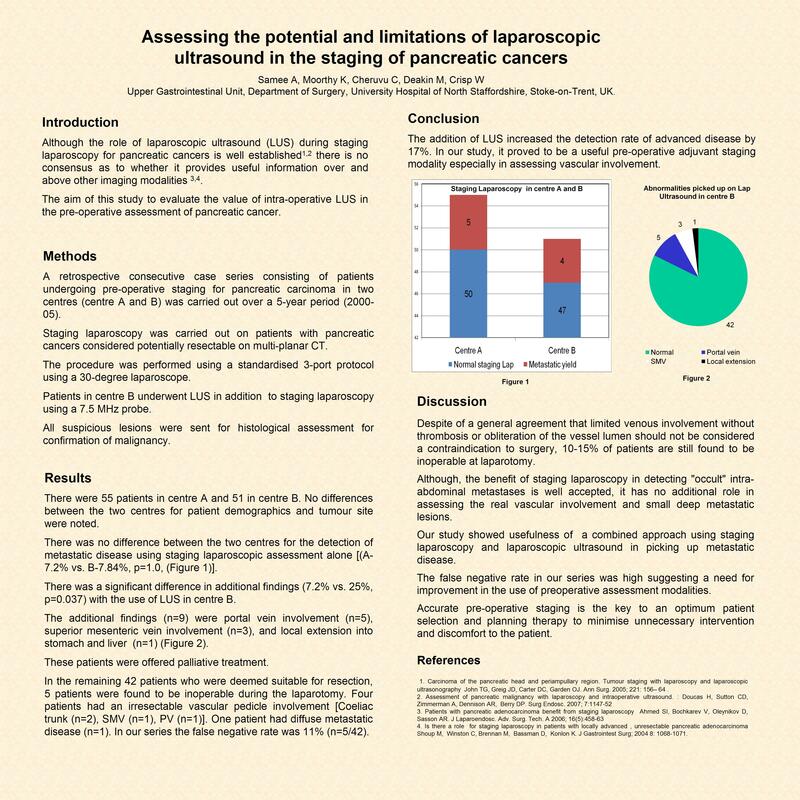 Introduction: Although the role of laparoscopic ultrasound (LUS) during staging laparoscopy for pancreatic cancers is well established there is no consensus as to whether it provides useful information over and above other imaging modalities. Aim:	To evaluate the value of intra-operative LUS in the pre-operative assessment of pancreatic cancer. Methods: A retrospective consecutive case series consisting of patients undergoing pre-operative staging for pancreatic carcinoma in two centres (Centre A and B) was carried out over a 5-year period (2000-05). It was routine practice to perform staging laparoscopy for pancreatic cancers considered potentially resectable on multi-planar CT. Staging laparoscopy was performed using a standardised 3-port protocol using a 30- degree laparoscope. Patients in Centre B also underwent LUS using a 7.5 MHz probe. All suspicious lesions were sent for histological assessment for confirmation of malignancy. Results:	There were 54 patients in centre A and 51 in Centre B. There were no differences between the two centres for patient demographics and tumour site. There was no difference between the two centres for the detection of metastatic disease using staging laparoscopic assessment alone (A-7.2% vs. B- 7.84%, p=1.0). However, there was a significant difference in additional findings (7.2% vs. 25%, p=0.037) with the use of LUS in Centre B. The additional findings (n=9) were portal vein involvement (n=5) and superior mesenteric vein involvement (n=3), stomach and liver metastasis (n=1) and local extension (n=1). These patients were offered palliative treatment. In the remaining 42 patients who were deemed suitable for resection, 5 patients were found to be inoperable during the laparotomy. 4 patients had an irresectable vascular pedicle involvement [Coeliac trunk (n=2), SMV (n=1), PV (n=1)]. One patient had diffuse metastatic disease (n=1). Conclusion: The addition of LUS increased the detection rate of advanced disease by 17%, thus making it a useful pre-operative adjuvant staging modality. It is especially useful in assessing vascular involvement. In our series the false negative rate was 11% (n=5/42).